We last looked at what separates apps on the Top Grossing list from the Top Paid list. We discovered that not all apps are created equal and that if you solve a big problem for users in a simple, delightful, and thoughtful way they will give you money for it. We also saw that In App Purchase can be a powerful and effective way to drive downloads and still earn money for your app. To answer these questions we'll need to take a brief trip through Microeconomics 101. Now, even though I have spent many years among you as a partner in engineering crime, I have a confession to make — my degree is in Economics. Not Computer Science, but Economics. In my career, I've found this to be a very valuable thing. Economics is, fundamentally, a way of thinking about the world, of understanding costs and benefits, of seeing the tradeoffs in how resources are utilized, and of watching the world at the margin to understand how the next incremental unit shipped, product created, or amount of time spent actually helps or hinders us in the end. In the same way, Computer Science is, at its core, the fundamentals of how to break problems down, how to understand them, and how to build simple, repeatable systems to deal with these problems. In many ways, these schools of thought are complementary and enlightening to each other. But we'll save any further philosophical waxing for another day. The first thing we need to get out of the way is a simple truth — you are here to make money. If you are not here to make money, you may exit to the left. Making money is not selfish, it does not lack altruism or nobility, rather it is the necessary task for all of us to live our lives and provide for ourselves and our families. At the same time, making money is not the only goal. If you truly care about what you are doing, you want to build something great. You want to change people's lives for the better. As long as you have the fire in your belly and the desire to do that firmly in soul, I'm here to tell you that making money can be the simple consequence of building great products. But you must also keep a watchful eye on how you make your money and how you can maximize your revenue, because the more revenue you have, the greater team you can build and the longer you can sustain yourself and your great passion. Your ability to charge for your app will vary greatly on something economists call the Price Elasticity of Demand (PED). To understand what this is and how it affects you, it's instructive to first look at an idealized demand curve. An idealized demand curve shows the relationship between the price of a good and the quantity people are willing to buy at that price. In the graph above we see a very simple relationship between the price of a good and the quantity of the good people are willing to buy at that price. For example, zero people will pay $100 for it, but 50 people will pay $50 for it. You will notice that I spoke of the price determining the quantity people are willing to buy, yet price is graphed on the Y axis (as if it were the dependent variable) — this is an idiosyncrasy in the way economists talk about supply and demand. For the purposes of our discussion, always remember that price is the thing you can control. Not all demand curves are created equal, just as not all products are equal. The demand for cocaine and the demand for metal bolts are very different, as you might imagine. What is important to take away from these simple graphs is that there is an incredible amount of business-critical information contained herein. If we know that 50 people are willing to pay $50 for your product, then we know that charging $50 means revenue of $2,500. This may seem simple enough, but we'll get into the underlying power of this shortly. Economists refer to two different types of demand curves at opposite ends of the spectrum — inelastic and elastic demand. Let's take a look at an elastic demand curve. Revenue is Price x Quantity. With elastic demand, lower prices are generally better. 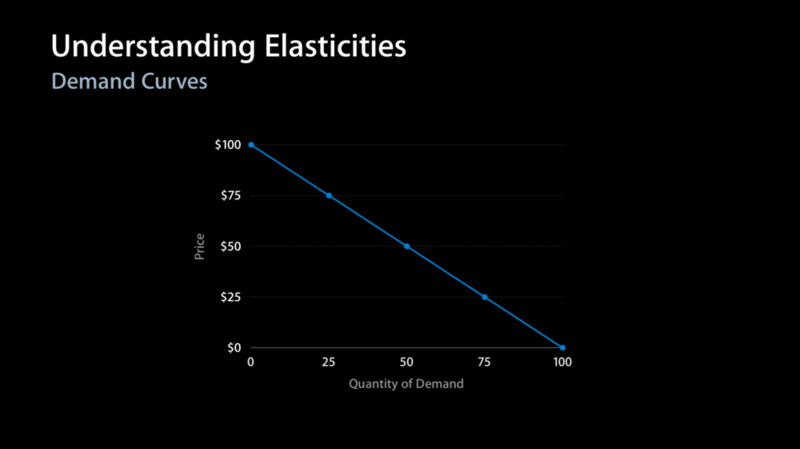 At a basic level, elastic demand curves represent products with a high degree of price sensitivity, like a metal bolt. If I walk into a hardware store, chances are when faced between any one of a series of seemingly identical bolts, I'm going to pick the one that costs the least. As such, as a manufacturer of these bolts, lowering price will likely have a big effect on how much money I make. Revenue is always Price times Quantity. As we can see above, in the case of elastic demand, a lower price means a large revenue box (labeled "Money! "), whereas raising our price even slightly results in that box quickly fading away. With inelastic demand, higher prices are generally always better. Inelastic demand curves express the exact opposite situation as an elastic demand curve. In inelastic situations, customers want a good really bad. Or, they may have no substitutes for the good in performing a necessary task. People with drug addictions typically show inelastic tendencies. If oxygen had a price all of us would probably pay whatever was necessary, etc. With inelastic goods, you could charge a lower price, but that would be stupid. The demand for your good is fixed or nearly fixed — raising your price will only increase your revenue box (Price x Quantity). With these fundamentals, we can begin having an in-depth discussion of elasticities and revenue maximization. You see, your products demand curve is a wonderful thing. It plots people's willingness to pay and your revenue potential all at once. You job "simply" becomes to find the point that makes the most revenue. As you can see below in the first half of the animation, lowering your price does move you along your revenue curve (on right), but continued lowering of your price can actually move you further down your revenue curve, increasing your unit sales, but costing you money. Lowering your price may help you increase revenue, but lower it too much and you cost yourself money. Loosely speaking, we refer to situations where a percentage change in price leads to a larger percentage change in quantity sold as elastic. Situations where a the percentage change in price and quantity sold are roughly equal are called unit elastic. And situations where a percentage change in price leads to a smaller percentage change in quantity sold as inelastic. These "zones" are labeled on the graph above to help illustrate their position on the demand curve on the left as well as the revenue curve on the right. My theory is that many apps in both App Stores are operating in the inelastic zone of their demand curves. The most important takeaway here is that lowering price is not the answer in all situations. In fact, lowering your price may actually be taking food off of your table. Depending on your app and your customers, an increase in price and a corresponding reduction in customers may actually make you money. As a simple thought experiment, I want you to think about the price of your app right now. Just think about it. Now think about how many people bought your app last week. If you doubled the price of your app, and you end up losing less than 50% of your buyers, you just made money. Think about that for a moment. If the percentage change in your price is greater than the percentage change in units sold, you just made money. As it turns out there are a lot of other fringe benefits from higher prices. Fewer customers means lower supports costs. Lower support costs means more revenue going toward development and future products. Higher prices also send so-called price signals to consumers and, assuming the quality of your app backs it up, enforces the notion that your app is well-crafted, thoughtful, and likely worth the price. And really, if you think about it, you're dealing with a pool of customers who have already voted with their dollars and expressed a deep inclination for a stronger, sturdier, more thoughtful and better formed experience on their Mac or iPhone. Don't you think the same could be said of your app? You might still be wondering how you can apply this to your own apps. Do you have an elastic or inelastic app? We'll talk about that more in the next part.